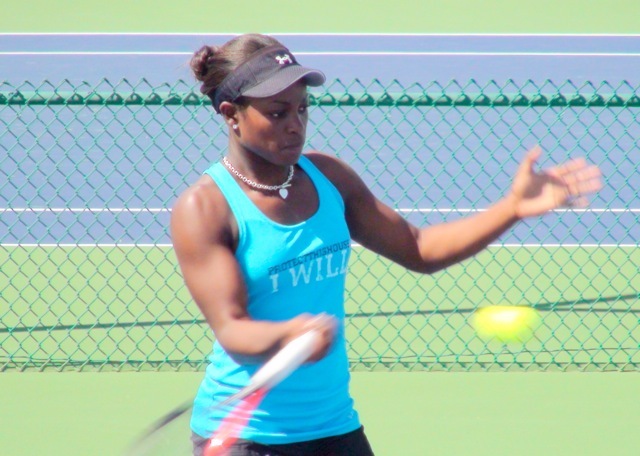 I wanted to wait before writing about the interview Sloane Stephens gave to ESPN magazine. Mainly because I knew that the print article itself would only have a literal shelf life of a few days before the inevitable angry outcry online would force Stephens to issue a retraction of sorts on social media. Which is somewhat ironic considering it was her being “dumped” on Twitter that many view as the most important catalyst for her candid comments about Serena Williams. What Williams did in terms of giving Stephens the “cold shoulder” both in the physical world and the online world after losing to her younger Fed Cup teammate in Melbourne has, not surprisingly, drawn the most attention after the interview was published. Tennis is a tough sport and a tough business and if Williams felt she had to do that for whatever reason, then so be it. But I actually feel an even bigger underlying issue, created by neither woman, was the initial spark that eventually caused Stephens to erupt so to speak in the interview. And that was the “mentorship” narrative. However one feels about the interview as a whole, I thought that Marin Cogan, the writer, did a good job of providing background context about Stephens and her very strange last couple of months. Cogan was correct to refer back to the many instances where comparisons were made about the two women since the start of the year. She writes, “One of the strangest things about the forced parallels between the two players is that Stephens’ life story needs no embellishment to make it compelling.” One of the “forced parallels” that Cogan refers to is the now defunct narrative created and advanced by many in the sports media over the mentor/mentee relationship that supposedly existed between Stephens and Williams. This narrative was first spun into a sticky web way back in January at the Brisbane tournament just as soon as the draw appeared and that a likely first time meeting in the quarters might come to pass. Numerous outlets began to publish stories suggesting a very tight bond between the two women even though; at least per my knowledge anyway, they were just friendly to each other, but nothing more. Now Stephens admits in the interview that she went along with the narrative in some previous press that she did, but it is clear that once the narrative starting getting out of control, that Stephens had had enough. So why was this narrative started to begin with? Probably because many reporters, starving for the next new thing to write about, found connecting Stephens to Williams and then embellishing their relationship was just too easy of a shortcut to pass up. This continued even though Stephens got some early flack for describing Williams’ grunts to her coach during their Brisbane quarterfinal as “disrespectful”. Stephens later described her comments then as just a joke, but it was clear that she wasn’t in awe of Williams. (And don’t forget the mini-backlash she got then for that) No matter though as many in the media continued with the whole “protégé” storyline. After Stephens beat Williams in Melbourne, now those creating the narrative had an even better ending then they could have hoped for with the pupil now becoming the master in their eyes. The narrative should have stopped there but it didn’t as Stephens began to gain more attention post-AO. Though it was Stephens who reached the semis of Melbourne, the narrative of her being Serena’s understudy was still the bigger story — not Stephens’ accomplishment in Australia. Instead of Stephens being pitched as the “next big thing”, she kept being referred to as “Serena’s heir apparent”. Post-Melbourne, Stephens started losing more matches than winning combined with feeling overwhelmed by an increase in media requests. As Miami rolls around, she’s not happy on the court or off the court. By now Serena’s “dumped” her, but people keep bringing up the whole mentor narrative. So when this interview opportunity rolls around for the magazine, Stephens finally has a chance to vent. “The people need to know!” Stephens said in the interview. This despite her mother, who was on hand during the sit-down with the writer, trying to gently urge her daughter not to speak so freely. Not to censure her daughter at all, but because her mother likely realized that a public backlash would soon come against Stephens, even if she was saying how she really felt. Anyway, the backlash certainly came two months later after the article was put to bed on the editor’s desk. By then Stephens’ losing streak remained in full effect after yet another first round exit last weekend in Madrid. Now the article is out, an immediate firestorm of mostly negative comments erupts, and Stephens has a PR nightmare to deal with. Not surprisingly, whether out of her own volition or from the not so gentle insistence of her handlers, Stephens took to her favorite medium Twitter to issue a mea culpa apology – chalking up the whole interview down to, as she wrote, “guilty of being naïve”. Stephens may have been naïve in not realizing what reaction her comments would bring, but I don’t buy the argument of some that her inexperience with the media is the reason the interview came out the way it did, simply because Stephens has been talking to reporters for a while now. It is a shame in some ways that she decided to backtrack on her comments because now everything Stephens said in the interview is viewed by some as the angry ramblings of a young player on a losing streak. If Stephens had remained steadfast and not issued that tweet about being “naïve”, she might have lost a few fans, but gained some more in exchange. But it was inevitable that Stephens would have to get out the “PR mop” and clean up the debris left in the wake of the print interview, even if she really did mean every word of it back then. Stephens, despite her recent success, still hasn’t earned enough clout to say, “If you don’t like it, then tough” when facing criticism and there is her future career and endorsement deals to consider. While journalists certainly love a good spat between two players, PR folks get very nervous if a client is being viewed as having a “bad attitude”. But we’ll probably never know for sure who decided, herself or someone for her, that Stephens should backtrack from the interview. To me, Stephens feels trapped. Her greatest success has in some ways now become her biggest obstacle to reaching the next stage in her career. The rest of the tour has moved on from Melbourne (Serena certainly has) but Stephens is still stuck on what happened during and after “down under”. If she can start winning tennis matches again, the focus will shift to her efforts on the court and not on what she said. But if she doesn’t, then don’t be surprised if this interview will be the subject of countless op-ed pieces with titles like “What Has Sloane Leaned?” and “Will Stephens Turn The Page?” (Actually this has already started, ironically on the many ESPN network platforms) How Stephens responds, both on the court and off the court, especially at Roland Garros where she is defending Round of 16 points, could say a lot about the direction her career is heading. The quote from Stephens that teased and then kickstarted the whole brouhaha was “They want another Serena”. Though it was in response to Cogan saying that American fans wanted to see another U.S. player do well, I think that quote also describes in some ways how Stephens’ run in Melbourne has turned into something negative, not positive, for the 20-year-old. The need is palpable in the U.S to find that next household name and in a hurry where the pro game continues to fight for eyeballs and dollars in a crowded sports marketplace. The continued decline in the number of pro events over here is often attributed to a lack of big American stars who can attract casual fans to show up. Stephens’ run in Melbourne suddenly seemed like the answer to a lot of people’s prayers and they were only too eager to shine the spotlight on her whether she was ready for it or not. While everyone around her decided to anoint her a star, Stephens herself, then or now, doesn’t seem sure if she wants to be one or not. (And let’s not forget several other U.S. players, men and women, who have said that they don’t like being in the spotlight either but have resigned themselves to that reality). Then add in the expectations to be just like Serena, who now views you as a threat by the way, and you can see why Stephens went off like she did in the interview. While plenty decried her candor, others have applauded it. But will this whole experience with the interview and then the backlash, especially in the last week, cause Stephens to be less open and honest in the future? Again, we won’t know for a while. Like many 20-year-olds, Stephens wants her own identity and to stand on her own. But whether she thinks it is fair or not, she will continue to be compared to Williams, even if the recent mentorship narrative has now been completely debunked. It is true that the proverbial “they” want another Serena, at least in terms of being a big star winning matches. But now that they have had a taste of Stephens going from being “America’s Sweetheart” to “That Bitter Brat”, will they accept whatever identity she chooses moving forward or still view her as just another version of Serena? We will see what “they” decide. As other’s have said, Sloane should pay more attention to her mom. I saw them at a challenger a long time ago. I wish I had the nerve to sit next to her mom and give her a hug (or at least some encouragement) as Sloane was doing a moody meltdown. As much as we love tennis, we should acknowledge that it can be a pretty ugly dynamic. A child with the weight of immense money on their actions. And parents that have some kind of part in that.